LiveCode LessonsLiveCode LessonsHow To - LiveCode Server Tasks Interacting with LiveCode ServerHow Do I Use AJAX with LiveCode Server? This lesson will show you the basics of using AJAX with LiveCode Server by demonstrating how to create a simple auto-complete box. You can see the working demo here. As this is a LiveCode Server lesson, we don't spend too much time looking at the basic HTML page. Instead we just take it from an existing AJAX auto-complete tutorial from nostrum.com. Download the source ZIP using the link at the bottom of the page and you should have a fully working AJAX auto-complete example that depends on a MySQL database and PHP. Don't bother setting up the database for now. Although using a database for this is a good idea and probably the best way to do this for a production application, we'll use a text file instead so we can skip to the important parts. This code is called whenever the user enters some text in the field on the HTML page. 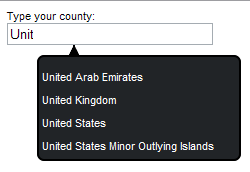 It loads a text file which contains a list of possible countries (one-per-line) and filters out the countries which the user could be typing. It then returns appropriate HTML to display these. We've done this for you by finding a list of countries on a website and using a quick bit of LiveCode in the message box to process it. The finished list is available at this URL: http://oliverk.on-rev.com/examples/autocomplete/countries.txt. Save it to "countries.txt" in the autocomplete folder. If you then upload the whole folder to your on-rev account, it should all work. Prev: How do I handle user input using LiveCode Server? "Download the source ZIP using the link at the bottom of the page"... I cannot find it, who can help me? 4. Open a webbrowser and request the index.html file. Thank you Torsten, that does seem to be correct. I will edit the lesson to add the link.